Flotsam are items floating as a consequence of the action of the sea. Jetsam are items which have been jettisoned by a ship’s crew. So technically, I guess I would be dreaming of flotsam, since my subject today is driftwood art. Cronk is among a group of artists who carve driftwood using the LuRon Technique. LuRon is actually a trademarked name for a method of developing finished wood sculptures from found wood. Artists learn specific techniques for cleaning, design development, and finishing and displaying completed sculptures. 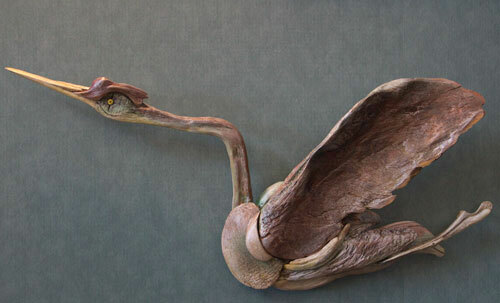 See the website for the Northwest Driftwood Artists for a gallery of beautifully carved pieces, and more information about this carving technique. I have some of my glasswork in a wonderful gallery in the historic downtown area of Janesville Wisconsin. I was dropping off some of my pieces, and browsing through the new things when I saw the driftwood birds created by Petranek. According to Raven’s Wish Gallery owner, Alicia Reid, Dave’s garage was filling up with found wood until he simply had to do something to justify building his collection. He fits pieces together into these crazy bird forms, using a light touch to impart a subtle color quality and richness to the piece. Petranek doesn’t have a website, but he does have a Facebook page with a couple more photos. 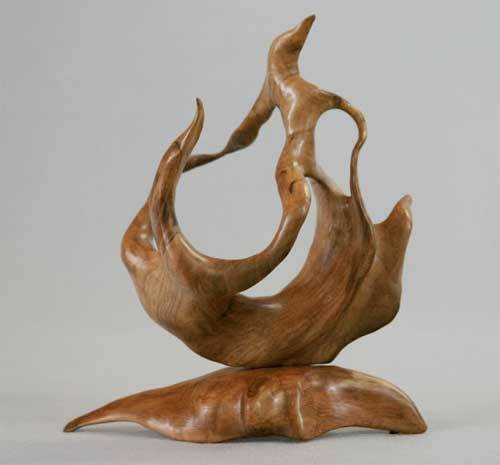 I can’t resist the lure of collecting these twisted, water-carved pieces of wood. This is one of my smaller mandala pieces, the glass is about 3.5″ wide. Something to hang, to catch the light, turning some flotsam into a little piece of art. 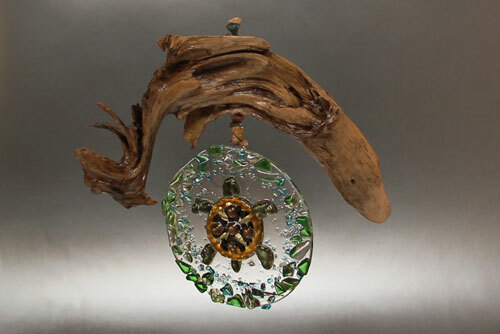 This entry was posted in Other Art and tagged Dave Petranek, driftwood art, driftwood assemblage, driftwood carving, Environmental Art, Gary Cronk, John Dahlsen, LuRon Carving, turtle mandala. Bookmark the permalink.